Vijayanagara, the City of Victory founded in 1336, was the capital of the most powerful Hindu kingdom in Southern India until the defeat by the Muslim armies in 1565. The city was established on the site of the village of Hampi situated in a spectacular rocky landscape along the southern bank of the Tungabhadra river. The ruins of the royal town comprise sacred and a royal buildings. Many temples were built from the eighth century onwards. 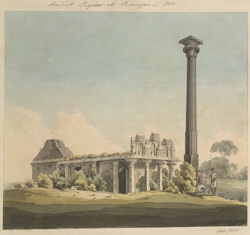 This watercolour possibly depicts the Kunthunatha (Ganagitti) Jinalaya at Kamalapur, a village south of Hampi with numerous Hindu temples.